Do you work in a paperless office? No? Then I have something for you. Here's an interesting Kinect hack that appears to have been developed last Fall but only came across my desk today. It seems a Japanese engineer has come up with a new use for the Microsoft Kinect. As you probably know, the Kinect is a motion tracking accessory for XBox, Windows, and whatnot. It's being used here to track the location of the trash as it is thrown in the air as well as the trashcan. I'm not sure who created this smart trashcan, but I did find a "making of" video. The narration and subtitles are in Japanese, so my details are a little sketchy. But from what I can tell based on the video, that is no ordinary trashcan. It's been hacked - turned into a robot, basically. In addition to motors, wheels, and a battery, there's also a wireless connection so the trashcan can be controlled from a computer. The operation of the smart trashcan is pretty simple. There's an app running on the PC which takes the data from the Kinect, crunches it, and sends commands to the smart trashcan. The trashcan is maneuvered so it ends up below the piece of trash before the trash hits the ground. But as cool as this is, what I would like to see is the next iteration of the idea. Rather than catch the projectile before it hits the ground, why not shoot it down? I'd like to see this idea be adapted to include a foam dart gun like the one at right. 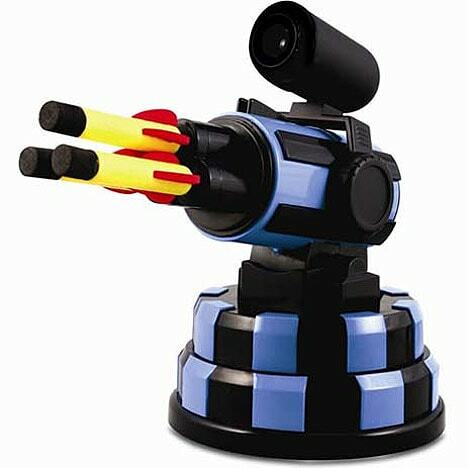 It's a USB powered dart cannon which incorporates a webcam. I can't find a place to buy it online, but the thought that it might be used to shoot down trash has a lot of appeal. I hope they’re insured against injuries due to people falling over trashcans in the middle of the floor. Unfortunately, no. The guy who was supposed to file the paperwork for the insurance tripped over one of the mobile trashcans. He’s in the hospital. How “Silent Running.” Thinking of the dicks in that movie who intentionally threw stuff for the bots to clean up.